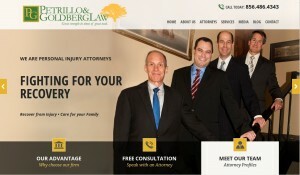 Petrillo & Goldberg Law launched a newly designed website. Pennsauken, NJ (Law Firm Newswire) October 15, 2014 – The Garden State is encouraging adult mentoring to amplify the impact of its successful licensing program. September traditionally marks the back-to-school period in the United States. This year, the mass return to classrooms in the wake of Labor Day, which includes a wave of teenagers driving to school, has been little different. This fall in New Jersey, highway safety officials decided to heighten public awareness of the importance of parental mentoring of teens to help reduce the incidence of traffic accidents among younger motorists in the Garden State. Nationwide, the incidence of traffic accidents, particularly fatal crashes, among teen motorists has been a serious problem. In 2007 alone, when youths ages 15 to 20 represented nine percent of the population and six percent of licensed drivers in the United States, 19 percent of all traffic fatalities involved crashes in which a driver was 20 years old or younger. Among those crashes, approximately two-thirds of the people killed were the 15- to 20-year-old drivers themselves or their passengers. In New Jersey, younger drivers represent six percent of all motorists in the state, but they have accounted for 14 percent of all roadway fatalities from 2003 through 2012. The National Highway Traffic Safety Administration has long stressed that younger drivers who lack the experience behind the wheel or the maturity level that most of their elders possess are more prone to the type of risk-taking behavior that can set the stage for a traffic accident. Such traits prompted the development of graduated driver licensing (GDL) programs nationwide to educate teens about roadway hazards, provide practical experience and discourage risk-taking behavior. New Jersey’s 13-year-old GDL program for novice drivers includes such provisions as an 11:00 p.m. driving curfew, a one-teen passenger limit if a licensed adult is not present in the car, a ban on all wireless devices in the car and a ban on plea bargaining when a teen is sentenced for a driving offense. Additionally, New Jersey is the only state that mandates display of a small red license-plate decal to identify permit holders or first-year probationary licensees. In September, state Division of Highway Traffic Safety (DHTS) officials emphasized the decisive impact of parental involvement with their kids’ driving education. According to state officials, parental involvement in teen driver training later proves itself: 98 percent of these teens do not receive traffic citations in their first year, and 92 percent do not crash their cars in the same first year of driving. Overall, New Jersey’s GDL requirements seem to have contributed to a major decrease in the number of teen driver roadway deaths in the Garden State. DHTS analysis has shown that fatalities among drivers 20 years old or younger have dropped every year but two in the last 10 years. In 2004, 103 New Jersey teens died behind the wheel. In 2013, a far-reduced 46 lost their lives. However, driving instructors have now been complaining for more than a decade that state resources are declining for equipment like driving simulators, which are a vital tool of driver education programs.